General Administration Department released @ www.gad.mp.gov.in GAD 59 Class IV Peon Posts. Apply through offline from 21st Feb 2018 To 31st March 2018. Check Detailed Advertisement for the GAD MP Recruitment Notification to submit the form in offline mode. Download Application form of GAD Madhya Pradesh Peon & Class Iv Category Post. GAD Madhya Pradesh Peon & CLass IV Vacancy 2018: Actually, in this Recruitment, all the Participants should complete the applications before 31st March 2018. If you are submitted the applications in time, your applications will be canceled by the GAD Board. 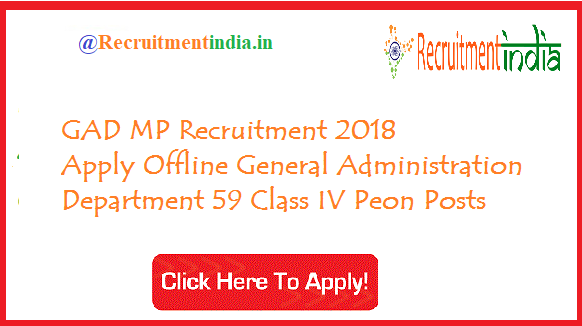 Know the recruitment details of the General Administration Department which is Under the backlog posts of Scheduled Castes, Scheduled Tribes & Other Backward Classes, Those following posts Vacancies are released by the MP state government which has to fulfill the gap in vacant seats likely in Calls IV Post Category i.e, Peon, etc.., Notification is released by the Madhya Pradesh Government. All applied one can submit the documents caste certificate / educational qualification certificates & birth certificate, self-signed certificates in addition to the native resident of Madhya Pradesh State within the closing date of application. General Administration Department Class IV Vacancy 2018: Yes!! This the Right time to submit the application form before 31st March 2018. In order to apply this Notification, all aspirants have the age limit between of 18 To 45 Years of age. If the Aspirants anyone have not satisfy the age limit they are not eligible for the vacancy. Basically, in this GAD which is in Madhya Pradesh State. GAD which is abbreviated as General Administration Department. in order to fill 59 Class IV Peon Posts, they commenced the Offline applications. The postal Address is also attached to this page. If you have any interest in joining to this Recruitment process, just send your details to the offline mode. Aspirants if anyone wants to shift to Madhya Pradesh STate Govt Jobs, click & Check out now immediately.